As I mentioned last week, my husband got a new hip and I spent some hours sitting with him. I wasn’t up for taking my laptop along, so I took some handwork. Instead of finishing a project that was already in the works, I choose to start something new……As my dear friend would say…shocking! I LOVE to start new projects! I do finish some as you have seen on my website and maybe at a trunk show I have given to your guild. But for me, I can’t resist something new. So, what did I start? These cute pennies! These are wool felt kits. Everything is included to get you started…needle, floss, die-cut shapes! Perfect as a take-along project. 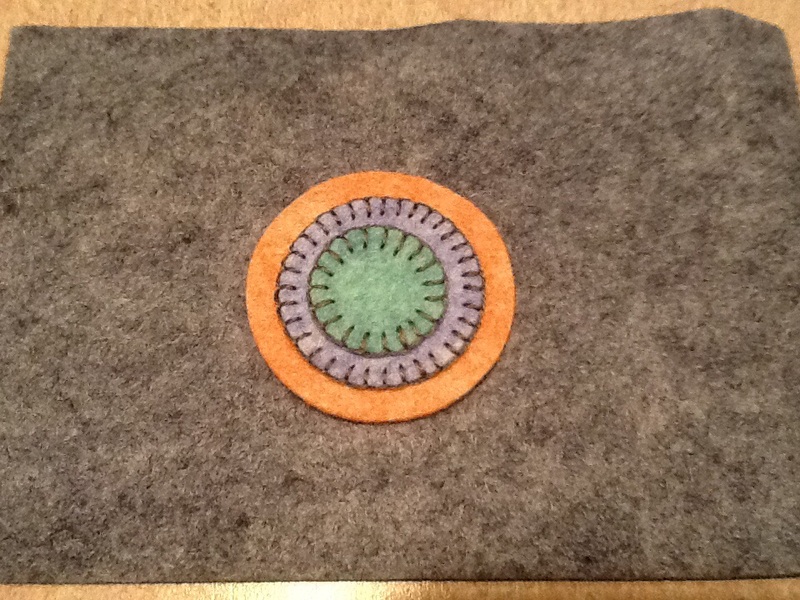 #1- Check out a wool felt kit from Grab’n Go Kits. All the shapes are cut for you! The buttonhole stitch is easy to master. But a couple of key pointers. #2- Keep those stitches EVEN! And when working around the circle always aim the inside stitch as if it was going to the middle of the circle. As you may notice, my stitch length on the center circle is a bit longer than the stitch length on the second circle. No problem, the same length was used all the way around its respective circle. That is what gives it a nice finished look. Now, back to the issue of not finishing…..
that will be for another time! This entry was posted in Handwork, Uncategorized. Bookmark the permalink.